Alexander Hamilton is best known as an American Revolutionary-era author, delegate to the Constitutional Convention, and first Secretary of the U.S. Treasury. This statue features a unique pedestal depicting the inauguration of George Washington. According to modern historians, Alexander Hamilton was born on the island of Nevis, in the West Indies, on January 11, 1755 or 1757. At the age of 12, after the death of his mother and abandonment by his father, he found employment with the local office of a New York merchant. Because Hamilton's business skills and intelligence were apparent, funds were raised to send him to America to further his education. After arriving in the United States, he traveled to New York City, enrolled at a grammar school in New Jersey, and then entered King's College (now Columbia University) the following year. Before the American Revolution, Hamilton expressed anti-British sentiments through letters, pamphlets and speeches. In 1775, he fought against the British in a militia company, and a year later he was appointed a captain of artillery. He continued to advance with his appointment as aide-de-camp to General George Washington with the rank of lieutenant colonel. Hamilton played an important role in the military victories of the Battle of Monmouth and the Yorktown campaign. In 1780, he married Elizabeth Schuyler, with whom he would have eight children. He was admitted to the bar in 1782, opened law offices in 1783 and founded the Bank of New York in 1784. As a delegate to the Constitutional Convention, he favored a stronger central government than the Constitution ultimately created but signed the document and worked for its ratification by delivering powerful speeches and collaborating with James Madison and John Jay on a series of letters published as the Federalist Papers. Appointed to be George Washington's secretary of the treasury in 1789, Hamilton consolidated the nation’s debts, established a financial system, and supported an economy that included manufacturing as well as agriculture. Although his differences with Secretary of State Thomas Jefferson led him to resign his cabinet post in 1795, he returned to government service as inspector general of the army under President John Adams from 1789 to 1800. Hamilton died on July 12, 1804, in New York City as a result of a bullet wound inflicted the previous day in a duel with his longtime political opponent Aaron Burr. He is buried at Trinity Church Cemetery in New York City. 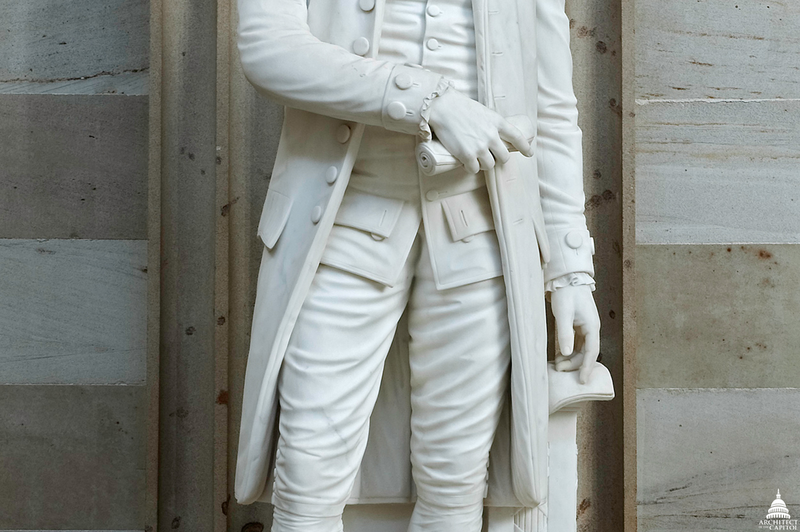 The statue of Alexander Hamilton on display in the Rotunda of the U.S. Capitol emphasizes his role in the framing of the new nation's government. His right hand holds the Federalist Papers, which he wrote to promote the ratification of the Constitution, and directs attention to his left hand resting upon papers that represent the Constitution. Detailed view of the statue's hands. Records of congressional proceedings from the 1860s show that sculptor Horatio Stone began work on the statue before receiving the commission for its creation from the Joint Committee on the Library in 1866. Stone executed the statue in Rome, completing the work in 1868, and shipping it to America, where it was placed in the Capitol Rotunda in November of that year on its unique pedestal. Detailed view of the pedestal. The pedestal for the statue, also designed by Stone, is distinctive with its incised symbolic scene on the front. The setting is a room—presumably in Federal Hall in New York—where figures of the American Revolution, including Benjamin Franklin and Thomas Jefferson, are gathered for the inauguration of George Washington. In the center, Washington takes the presidential oath of office as administered by the Chancellor of New York, Robert Livingston. Hamilton stands in the background placing the Constitution atop the American shield and sword. These objects represent the foundation and strength of the new nation. 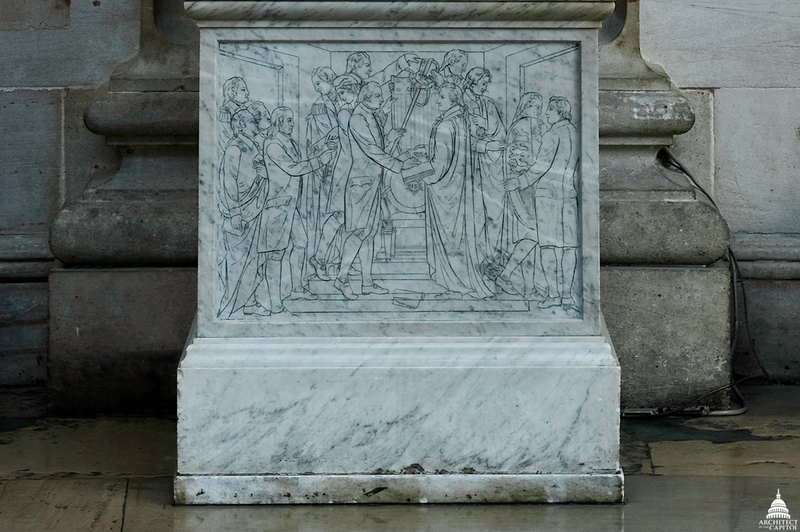 The pedestal was not part of the original commission, but Stone was eventually paid for it in 1871. Shortly after its arrival at the Capitol, the statue was moved to National Statuary Hall, and by 1900, it was on display again in the Rotunda, where it has remained. Horatio Stone was born in Jackson, New York, in 1808. Stone's attempts at woodcarving as young boy showed his early interest in sculpture, but he left home as young man to study medicine. In the mid to late 1840s, he closed his practice and moved to Washington, D.C., to focus on sculpture. He became interested in the decoration of the Capitol as a founder and president of the Washington Art Association, which evolved into the National Art Association. In 1858, the Association petitioned Congress for the formation of an art commission to oversee the acquisition of art for the Capitol; the commission existed for only one year. Stone maintained studios in Washington, including, for a time, a room in the Capitol, and worked on his sculpture in Italy. He sculpted three other pieces in the Capitol: John Hancock (1861), the Federal Vases (1871) and Edward Dickinson Baker (1876). He died in Carrara, Italy, in 1875.